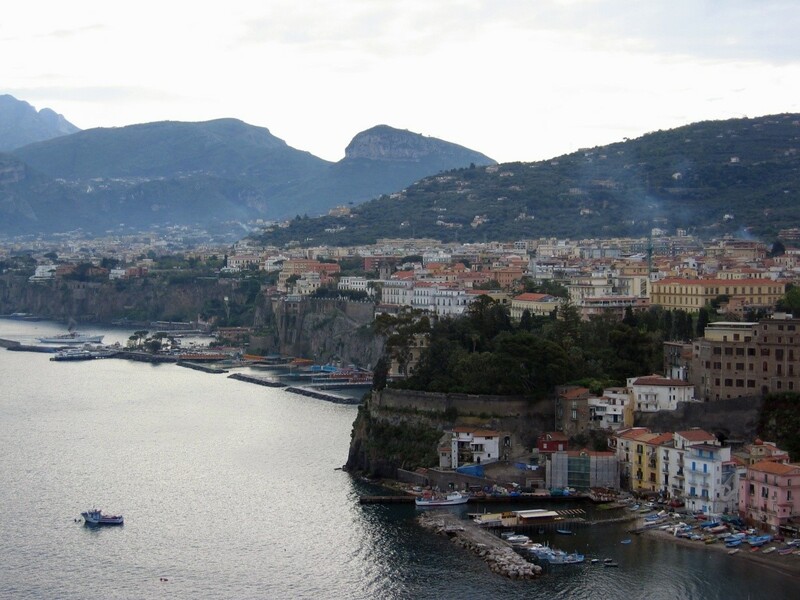 The Sirens of Sorrento are Calling! 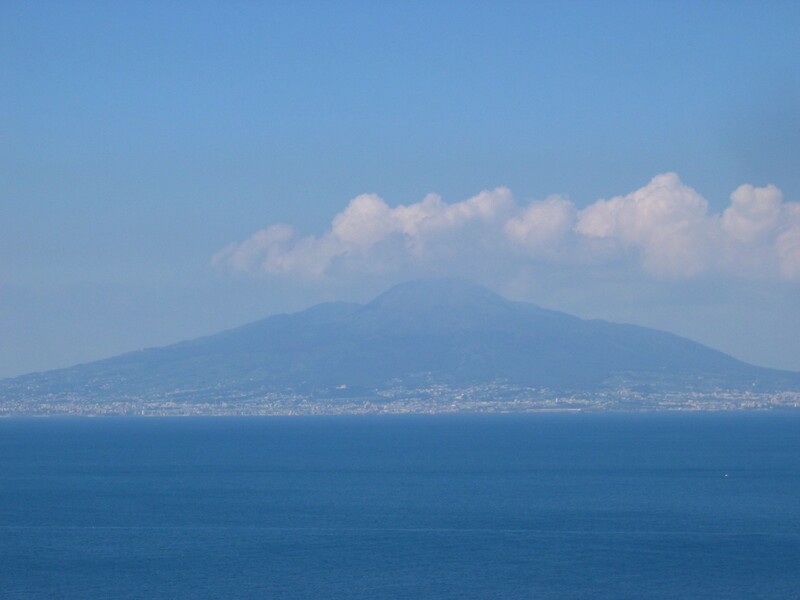 On that Ciao for Now trip a few years ago one of the favorite places I explored was the lovely Sorrento. My friend Dot and I visited Sorrento prior to starting our classes in Florence. Sorrento is the gateway to the Amalfi Coast in the Campania region of Italy. The rugged coast with its vertical stone cliffs is breathtaking. And the city itself has a charm of its own. We stayed in a highly recommended hotel named La Tonnarella. Our room was numero uno, number 1, with a stunning view of the bay and the Volcano. Below is one view from our deck. When we tore ourselves away on the first day we simply strolled down to the town and wandered. Everywhere we went we were offered a taste of Limoncello, Italian lemon liqueur. Each shop sold its own brand of Limoncello. After a few shot glasses it was difficult to discern which one was best. I was very shy in Sorrento. I was still nervous about being among strangers, not trusting that it would all be all right. Dot, on the other hand, had great experiences with everyone we would meet. I did not have those innocent experiences. Why did she? Dot told me that she expected to be treated well and she was treated well. She said most people are good and kind. Really? Are they? That had not been my experience. Watching Dot with others made me question my own preconceived notions about people. She trusted people. I did not. She believed people were good. I believed that intellectually but emotionally, no, I did not believe that. I was afraid of them. I held back. Dot wasn’t afraid and blindly (or so I assumed) went about like Pollyanna, expecting human nature to be the way she was. Hmmmm. Was that the key? The bartender knew the owner of the shop across the street and called him at home. He then told Dot to return around lunch time and he would see if he could get her things. When she returned the dry cleaner was there with her clothing, gave it to her without even charging her and wished her well on her journey. What? I began to realize something about myself. Maybe it wasn’t the people who were not to be trusted. Maybe I did not trust myself. Perhaps if I could let go of some fear I could experience life more like Dot did. Maybe. This was the beginning of the healing for me. And the beginning of my true journey. It was a soul journey, a journey dell’anima. I was on my way. Sorrento was the ancient home of the mythical Greek Sirens who called sailors to their own demise on the rocks of Sorrento. And perhaps, just perhaps, my dear friend Dot was like a Siren calling my soul with an expectation of joy and laughter. Grazie mille Dot!